Day 354: Marché de Noël, originally uploaded by susanvg. Flutissimo played another concert, this time in Vieux Longueuil as part of the Marché de Noël. 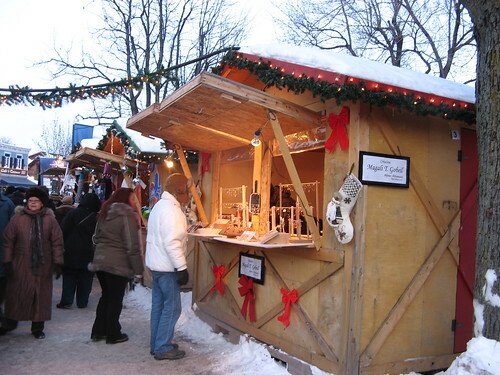 Little cabins surround Parc St-Marc, housing stalls selling all variety of crafts from food to toys to other gift items. It's nice to see the unique items - not the mass-produced "Made in China" items found in most stores. There is a variety of festivities which take place both outdoors and indoors from dancing to train rides for children to concerts. This is patterned on an open air Christmas market which is held each year in Strasbourg, France. It can be quite cold, but there were small fireplaces set up where people could warm themselves. Looked like fun, but I was lugging all my instruments, so there was no time to really look around. How many instruments were you lugging? It looks so lovely. Ages ago I went to a Christmas market in Munchen. It looked similar. But - you managed to share these pictures with us - did you put the instruments down? 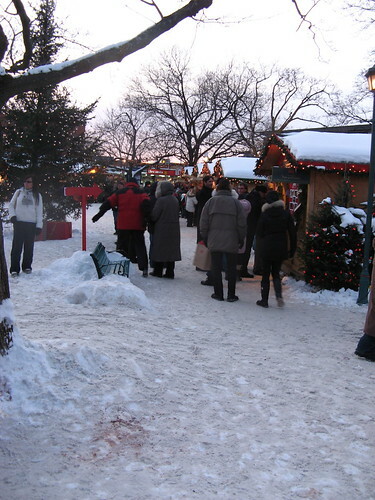 Everyone is bundled against the cold - looks like a great way to celebrate the Holidays.